Happy 2010 to everyone out there! I figure that 10 years into the 2000's, we're now officially in The Future, right? Well, it's not without its downsides. 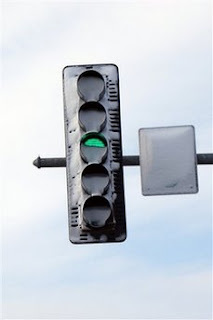 For example, traffic lights are beginning to be made with LEDs instead of incandescent lamps - this is good because (1) they use less energy and (2) they'll practically never burn out. But it turns out that the old-fashioned bulbs were good at something else: melting snow. In this photo (from the Oswego Police and AP), you can see the LED light having a problem with that particular trick. This is nothing a redesign can't solve - add a heating element that only kicks in under a certain temperature, for example. But it shows that progress sometimes involves a few unforeseen delays.